Energy use is often double what some energy modelers estimated at the start, according to a new report by the National Institute for Building Science (NIBS) and the New Buildings Institute (NBI). Occupants are not consistently engaged to share responsibility and achieve efficiency. Building operators are not engaged as part of the project team and often aren’t compensated in alignment with the important work they do. Design-bid-build is still favored over integrative process, leaving efficiencies unrealized. Benchmarking data and methods are both out of date; the authors argue that a more fluid system that can be updated easily and frequently would make more sense for benchmarking real-time performance. With these barriers and goals in mind, NIBS and NBI intend to outline tools and resources for policymakers and industry, develop a new method for collecting and storing building performance data, and then create pilot projects to test their ideas. “The next step will be getting others in the building industry to begin preparing for outcome-performance as the new norm,” Ryan Colker, director of NIBS, states. One way that the group plans to achieve this is through successful case studies that will reveal the necessity of post-occupancy testing to accurately measure building performance. What's the Question Being Raised Here? 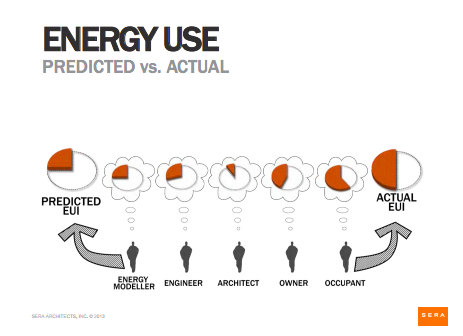 There's a gap between modeled energy use and actual performance. We know that. But the four reasons listed aren't about that gap. They are about why buildings aren't achieving higher energy performance. I'll give one example. If efficiencies aren't captured because of failure to employ a integrative design process, those potential efficiencies shouldn't be in the model!!! I'm not saying we shouldn't be looking at ways to improve actual performance! I'm saying that there are two questions here. (1) If accurate, predictive modeling is the goal, how can we do it better? (2) How can we improve actual building performance? There are crossover issues between these two questions, but let's make sure we understand each of them and don't conflate them. I think this article is addressing question #2 above. Let's not arbitrarily drag energy modeling into that discussion! To the extent that integrative process includes building operators and occupants, and extends into occupancy, I think integrative process does belong on this list. And I don't think accurate, predictive modeling is the goal of these particular organizations. I think measured outcomes and outcome-based benchmarking are the goals. That leaves modeling as a design tool. The success of the overall advancement to outcome-based performance will require a coordinated approach. Design and construction must be linked with operations and maintenance to realize performance goals.